Computex is a technology show that you may not have heard of, yet the show will see the launch of some exciting new technology. It runs Tuesday 4th June through to Sunday the 9th in Taipei, Taiwan, and we’re already seeing some exciting news coming out pre-show. Computex, as the name would suggest is a show which focusses on the PC. The shows future, at least in its current format, is in some doubt as recent research shows that the PC is declining at a faster rate than predicted. Three years after Steve Jobs launched the post-PC era with the Apple iPad, research from IDC predicts that shipments of PCs will decline by 7.8% over 2013. This is a dramatically higher figure than predicted by the same firm (1.3%). With the 58% growth expected in tablets over 2013, they are set to overtake PC sales as early as 2015. One of the more exciting launches pre-show was the Asus Laptop which is set to run BOTH Windows and Android OS’s. The dual-booting Transformer Book Trio could set a whole new trend in portable laptop computing. Other pre-show disclosures include a 6 inch smartphone and a trackpad/mouse hybrid computer input device. Hybrid devices: A new era in computing? 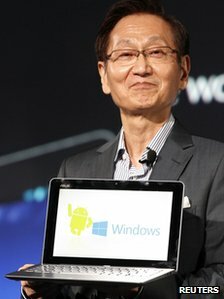 Acer kicked off the announcements with news of an 8.1in tablet which can run the full Windows 8 operating system. The aim of the device is to make the tablet work effectively with one handed navigation, much like you use your smartphone. The local Taiwanese company also announced a large 5.7in Android handset, which is its debut into the rapidly growing “phablet” market. A Phablet is the combination of a phone and tablet, at a size which sits between the average sizes of the two device types. Asus, also based in Taipei made possibly the more exciting announcement with their Transformer Book Trio. This is being marketed as the first three-in-one desktop, laptop and tablet device. Aimed at delivering a smooth transition between devices, it could herald a new era of hybrid computing. Previous articleTreadmill Vs heart rate monitor: Which gives the most accurate calorie count?